Amy Dale is the Owner of Green Edens Horticultural Services, founding the company in 2011. Amy is a Master Gardener through the University of Illinois and works on the Evening Island at the Chicago Botanic Gardens. She is pursuing a degree in Horticulture with a focus on Sustainable Landscaping and Design. Amy led the Garden2Table program at Ridgeville Park District in Evanston from 2012-2016. 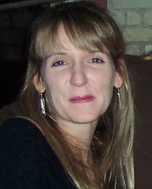 Amy has over 12 years experience as a detail oriented Business Manager. In her 12 years of managing a holistic health care practice, she became aware of a variety of different healing modalities. It became apparent to her that people derive their healing from many different avenues, including nature. Participating in and bringing balance back to nature is what resonates strongly with Amy, feeds her and is the focus of her business. During that period and in her study of horticulture, she also developed a greater awareness of the importance of taking care of our environment. Amy believes wholeheartedly that the health of mankind and the health of the earth are inseparable. With her training in horticulture and at the University of Illinois Master Gardener Extension Program, she gained the knowledge necessary to help re-establish that balance in nature brought about through sustainable gardening practices. ​Pam Karlson is a garden designer and professional gardener certified through the Joseph Regenstein, Jr. School of the Chicago Botanic Garden. Also a career artist, she brings her creative vision to her designs, cultivated through her art college education and profession. Passionate about nature and the environment, Pam created a bird garden habitat in her Chicago backyard. Having documented over 110 bird species, she developed a presentation “Birds in the Garden”, featuring her garden and her photographs of visiting birds and pollinators. Presenting to organizations around the Chicagoland area, she hopes to inspire others to create beautiful, environmentally beneficial gardens, incorporating natives and native cultivars. In addition to her career, Pam has been rescuing migratory birds for over 15 years as a volunteer with a licensed wildlife rehabilitation organization. She also enjoys hiking and the outdoors, as well as watercolor landscape painting, sculpting, and of course gardening!